Our long weekend started with Turkey Bowl. Mark didn’t play because he was leaving for hunting the next day and didn’t want to risk being sore, but I played. 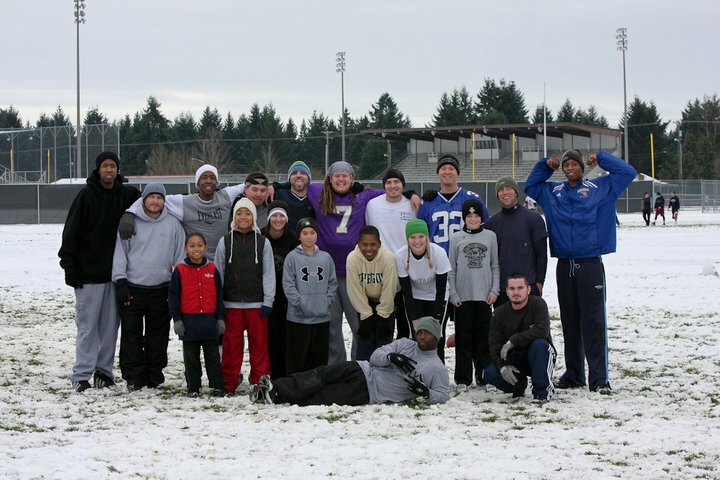 And, like another football playing Mansfield I was the center for all but a few downs. Turns out I’m better at tackling people than scoring TD’s! 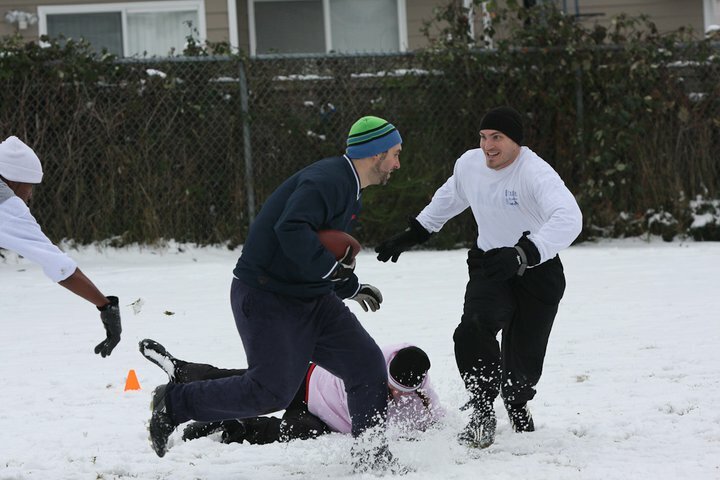 It was two-hand touch with “soft” tackles and having snow made the take-downs a little softer. I had a ton of fun and can’t wait for Santa Bowl the day after Christmas! Nolan about to tackle Josh and me on the ground behind them. I think I slipped trying to get to Josh. The whole gang…thank you Mark for taking photos!! After Turkey Bowl we headed to the parents for Thanksgiving dinner with all of the local family. Lot’s of good food, wine and fun! Mark was up at 2 something in the morning Friday to get ready to leave for hunting and since I was awake anyway I decided to go wait in line at Target for the 4 am opening, to only end up getting $32 worth of stuff. Totally not worth standing in line for! I was home by 6 and went back to bed before spending the day/night with Michelle and the girls. We had decided that while the boys were hunting we would decorate her house for Christmas and have a slumber party. Love Hot Butter Rum, watching some great college football, and hangin with the girls. Saturday I spent most of the day grocery shopping and running errands. I kind of forgot how much longer everything takes this time of year, and had a wicked headache by the time I got home. I spent the rest of the day chillen on the couch watching football and movies. Actually I did manage to get all the laundry done and the house cleaned even though my head hurt. I was motivated though because I wanted to be able to do nothing but watch football on Sunday. Usually I’m trying to clean up and fold cloths etc during commercials, but there are no commercials with the Red Zone and I really wanted to be lazy for a whole day. Josh, Meka and Peanut came over to watch the Hawks game and flip over to the Red Zone now and then to catch the Vick action.